How to stay connected to your community including programs run for seniors, transport help and support if you’re raising grandchildren. Government engagement activities for seniors including the Time for Grandparents Program and Community Cabinet. A range of programs are available to help you reduce your risk of isolation, improve your health and strengthen your links with your community. 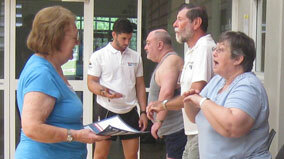 The Logan City Council runs a program for seniors who are looking for healthy life options. Gentle Exercise classes are a great introduction to exercise for older adults or for those with chronic disease including heart or lung disease or diabetes. Call (07) 3412 5952 or email insports@logan.qld.gov.au for more information.